The global shipping industry is facing calls to follow the example of the car industry and cut its carbon emissions. The International Maritime Organisation's environment committee is meeting in London this week to try to agree a global plan for reducing emissions levels. Without a clean-up there are warnings that shipping could account for almost a fifth of carbon emissions by 2050. Container ships use fuel that has 3,500 times more sulphur than car diesel. International shipping carries about 90% of world trade but there has been no regulation of carbon emissions. This is despite a provision under the 1997 Kyoto Protocol that gave responsibility for handling carbon emissions from marine fuels to the International Maritime Organisation (IMO), the United Nations division responsible for global shipping. It has proposed a 50% cut in emissions by 2050, a move that does not go far enough for certain Pacific island nations that are most threatened by rising sea levels. Monday's meeting of the IMO's Marine Environment Protection Committee will hear a proposal that emissions should be cut by as much as 70% to 100% by that time. 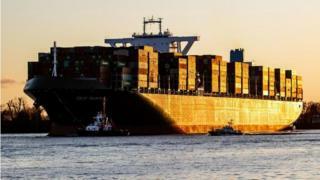 There is opposition to this from Panama, Brazil and other countries that depend on income from shipping, which say their economies could be damaged if action is too hasty. Shipping was excluded from the Paris Agreement on climate change. Christiana Figueres, a former UN chief negotiator on climate change and an architect of the Paris Agreement, told BBC Radio 4's Today programme that some countries were already taking action. "One very interesting announcement made last week came from [South] Korea, which is ordering more than 200 new ships for its fleet. These are 30% larger and 30% more efficient," she said. The largest container ship currently operating carries just over 20,000 containers. However, Ms Figueres pointed out that not all countries would have access to finance for such a change, and an international finance fund should be set up to help less wealthy nations.